Alice Wade Provaznik, 81, was heartbroken. 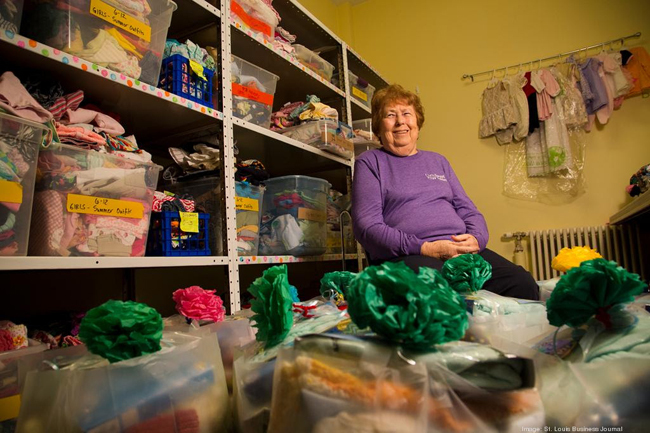 As a volunteer in the St. Mary’s Hospital gift shop, she heard that nurses on the maternity floors were going to garage sales and resale shops on their days off, buying baby clothes, laundering them and giving them to patients who had nothing for the babies they were bringing home. So Provaznik went into action, founding Sweet Babies, a grassroots effort that gathers, launders, inventories and bags baby clothes and other items and raises money for additional baby things for new mothers in need. Kicked off in 2010 under the aegis of St. Mary’s, in July 2014, it received 501(c)(3) status with Provaznik as president. The Sweet Babies warren of offices — jammed with baby items — is housed in St. Francis Hall on St. Mary’s campus. Provaznik was born and raised in St. Louis. She attended St. Gabriel grade school and Notre Dame High, and at age 20, married Richard Provaznik, an attorney. The couple lived in South St. Louis and moved to Richmond Heights where they delved into politics. He served as mayor of Richmond Heights and as a circuit court judge. Provaznik’s life was busy as the mother of six children. When her children were little, she volunteered for Little Flower Parish, at Bishop DuBourg High and Meals on Wheels. When the kids grew older, she began volunteering at St. Mary’s. That was more than 30 years ago. In 2012, SSM recognized Provaznik’s work with an award for exceptional commitment, Becker said, as she truly helps the organization live its mission. How did you come up with the moniker Sweet Babies? I kept referring to the babies as “such sweet babies.” The name stuck. How did you start the charity? I began telling anyone I knew about the need and asked for donations. Word spread and things just appeared on my porch, back steps or at the front of hospital where the valet took them in. We laundered the few items and assembled maybe 10 bags a month. The social workers interviewed mothers in need and handed those mothers a Sweet Babies bag before leaving the hospital. As it grew, what happened? We wanted to give the mothers more as we collected more. Hospitals are limited as to what they can give away because it looks like an incentive. Once our bags became bigger and more valuable, we had to apply for nonprofit status. My neighbor, Joan Killgore, a health care attorney, did the work pro bono. What is the output of Sweet Babies today? We hand out 1,000 bags a year. Not only do we give to new mothers at St. Mary’s, we also give about 50 bags a year to expectant mothers in the St. Mary’s clinic, 18 bags a month to Midtown Catholic Charities, and five bags a month to Nurses for Newborns. What’s in a big bag? About 90 items — 50 diapers, wipes, caps, socks, sleepers, booties, outfits — up to size 12 months — bibs, burp cloths, onesies, books, blankets, sweaters, or jackets, to name a few. About 30 pieces of clothing in three sizes are wrapped in three receiving blankets. The bag is tied together with a crepe flower. At some point, we’d like to add a first-rate book on childcare. Smaller bags, given in the clinic as an incentive to encourage expectant mothers to make their well visits, have 35 items in a yellow cloth bag printed with our logo and name in blue. How else do you get baby items? People started holding baby showers at nursing homes. We also get boxes from all my kids, who live here and out of town, and their friends. Everyone has baby clothes that can be recycled. And local students get involved to earn volunteer and confirmation hours. Any other special volunteers? We have prisoners in Potosi who make all our hats. They weave them on looms because they can’t have needles. They also make booties by taking a man’s comb in each hand and using the teeth of the combs to crochet. We get yarn for them. A friend of mine who’s a shut-in makes the tissue paper flowers for the bags. Another friend removes all the tags on new clothing. Who assembles the items once they’re donated? We have about 15 volunteers. Some come every week, and others are more sporadic. We work only mornings and on Saturdays and Sundays. Having a big family also helps. I’ve recruited my children, grandchildren, nieces and nephews. Do you ever buy items? We do and have shoppers — two Dominican nuns, one woman who loves to shop for baby clothes and the mother of a friend of mine who is a big proponent of including children’s books in our bags. Many clothes are recycled. Who does the laundry? My next door neighbor’s husband, who’s a chemist, will come by and say give me the clothes to launder. There’s a nurse at Barnes who likes to do baby laundry and a professor across the street who pitches in as well. How else does the community at large help? I went to this luncheon for area hospitals and met Linda Loewenstein of The Lawrence Group, who was sitting at my table. Next thing I know, The Lawrence Group did a shower for us and they are doing it again. Last year, because The Lawrence Group was celebrating its 30th year in business, they chose 30 charities to support. We were one of them. Each charity got three to five people who donated their time and talent. They put together our website, sweetbabies.org, and our facebook page, facebook.com/sweetbabiesSTL. Has Sweet Babies done any fundraisers? We’ve had three, a picnic at Shaw Park where more than 120 people showed up. The price of admission was to bring one baby item. We also heard there were mothers who had no safe place for their babies to sleep or play. The Italia-American Bocce Club wanted to do a fundraiser, and we asked them to raise money for us to buy Pack n Plays (play yards) that cost $40 for the basic model. They raised $2,000 for us. Also, we did a recycled purse sale called “Bags for Babies” and raised $2,000. Have you applied for any grants? We received $500 from The Laclede Group through one of our volunteers who has a family member who works there. Barb Fisher submitted information about us to the Missouri Athletic Club Charitable Society for Children. Out of 32 charities, they pick three and we were selected. We don’t know the amount yet. What is the most labor intensive part of this program? When there’s a large donation, the task can be daunting. We have to account for all donations for our 501(c)(3) status. When one of our friends had a shower that took in lots of items, four of us spent 16 hours to inventory everything. After we inventory, anything that is stained we discard. Then we assemble the bags. It can take three volunteers to put 10 bags together. We send them up to the 6th floor, and they go into a closet. What are some of the biggest hurdles in doing this work? There’s a huge need for diapers because they’re expensive and not covered by food stamps. We give away 42,000 diapers. There’s a new organization called the St. Louis Diaper Bank that is struggling. They donated about 1,500 diapers each month to us for three months. What would you like to see happen to Sweet Babies three to five years from now? Ultimately, we’d like to see a Sweet Babies type program in every hospital in St. Louis. ©2015 Sweet Babies. All Rights Reserved.